You walk into your average department store. You need help looking for a particular item. There is no “help” around to assist you. You finally get so frustrated you go to the front desk. They page the manager. The manager assists you in locating the item. Your problem is resolved. In this example, there was a person in charge available to help you resolve the problem. But what do you do when you are having a problem with your dog? Your dog is getting into the garbage pail. Your dog has housebreaking problems, suffering from separation anxiety, chewing inappropriately or can have a myriad of other problems. What do you do? There is no manager to call. In fact, like it or not, you are the manager! And short of firing your employee — the dog — you need to deal with it. 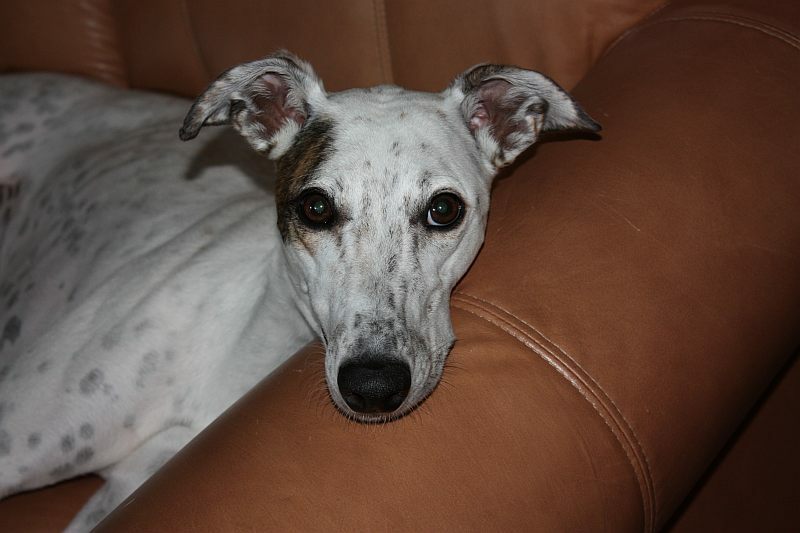 You as your dog’s manager have many different options available to you, including dog training books, professional trainers/dog behaviorists, or your greyhound adoption group. You need to find the option that will be the most comfortable for you to pursue. This rewards the dog for doing the right thing. For example, if your dog is waiting quietly to be petted, you pet him. Ignore the problem behaviors. Offer alternative behaviors. If your dog chews a shoe, take the shoe away and hand him his chew toy. Negative reinforcement punishes inappropriate behavior. Negative reinforcement uses punishment as the result of inappropriate behavior. What do mean I’m not supposed to be up here? I attended a seminar on dog training which used a technique called set-ups. When you use set-ups, you allow the dog to correct himself while doing something inappropriate. You as the manager do not confront the employee (dog) who is doing something wrong. 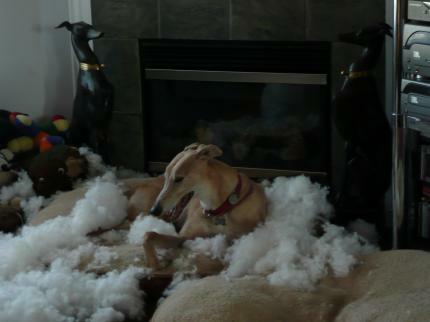 Tauren, my black male greyhound, had a habit of swiping pens off the coffee table, carrying them into the bedroom and munching them at his leisure. This was getting to be quite irritating not to mention possibly physically dangerous to him. To prevent a dog from stealing things off the counter, for example, create a set up. The set-up for this situation was simply some fish line with soda cans attached to it. Attach this little gadget to something on the counter. If the dog jumps and swipes the object, the cans come tumbling down, scaring the dog. Thus the dog would not attempt to jump on the counters again. Sometimes set-ups have to be done a few times. In Tauren’s case I had no soda cans or fish line, so I got the brilliant idea of attaching a pot lid to some sewing thread and attaching this to a couple of pens deliberately left on the coffee table. Tauren snatched the pen off the table but because the pot lid was so heavy, the pen moved but did not bring the pot lid down onto the floor. In fact, the pen was dangling from the edge of the coffee table. I forgot to put my set-up away and later that evening I heard crash come from the living room. I ran back into the living room where my poor husband was standing holding the pen with the pot lid attached to it. “Dog training seminar stuff?” was my husband’s rhetorical question. Oops! Another example of a set-up to correct dogs from jumping on furniture is to take double-sided masking tape and attach it to the cushions of the couch in two horizontal rows and two vertical rows. The dog jumps on the furniture and gets sticky feet. Most dogs will not find this comfortable to lay on and after a couple of repeat tries they will eventually stay off the furniture with only a small piece of masking tape on the cushion as a reminder. Using avoidance rather than confrontation is another way of dealing with a dog management problem. If your dog loves snuffling through the garbage pail, you can either yell and scream at the dog every time he or she goes into it or do something really simple. Take the garbage pail, put it some place where the dog won’t be able to reach it. The garbage pail could be relocated to the closet or perhaps under the sink. Problem resolved. This example of avoidance rather than confrontation involved a natural bone. Tauren would not allow me to take it from him, or if Sultan came by, Tauren would physically attack him because the bone was his. This situation was resolved two ways. First, we got rid of all the natural bones in the house and substituted Nylabone of which Tauren was not so possessive. I handed Tauren a toy. I asked him for it by saying “drop-it.” I took the toy and give Tauren a treat. I repeated this daily with all his toys and rawhides. He learned to ‘drop it” quickly because I provided him with a tasty alternative. “Leave-it” is simple too. When you are out for a walk and the dog sees something delectable on the side of the road tell him “leave it” and walk quickly in the opposite direction. The dog will get to the end of his leash, correct himself, and quickly walk to catch up with you. Another example of using avoidance. Rather than dealing with dogs around the kitchen table begging and slobbering for treats, take the dogs and put them in the bedroom with a baby gate up. We can eat our dinner peacefully and the dogs are rewarded at the end of our meal with their cookie treat. A long term solution is teaching your dog a good down-stay while you are eating. Your dog enjoys eating feces (fancy term coprophagia). You can purchase stuff to put in the food to make the feces taste icky. Apply Adolph’s meat tenderizer or pineapple juice to his food to cause the same effect. You can tape up your dog’s muzzle or install a professional (stool) nose cover to prevent the problem. Or the simplest method of all. Pick the stuff up as soon as he or she defecates thereby avoiding any of the other alternatives. 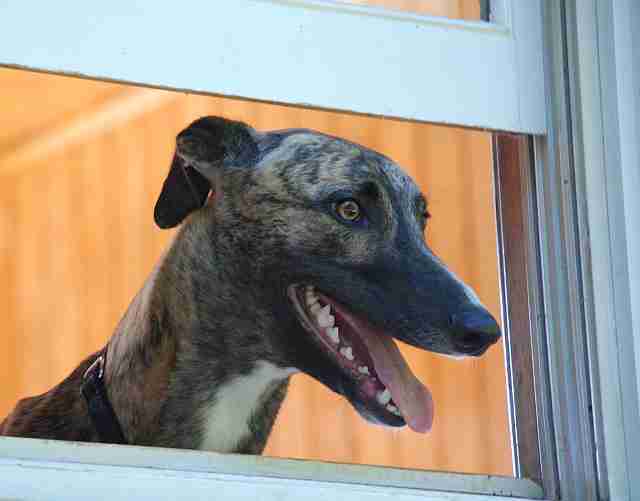 Some greyhound owners have problems with dogs bolting through the front door or fence gate. If you have children who forget to shut the fence gate, the easiest solution is purchase a lock with a key to prevent the gate from being opened. For those who have dogs that bolt through the front door or jump too eagerly from the car, you need to teach the dog the “Wait”command. In “Wait” the dog may be lying down, sitting or standing. There are several different ways to teach the dog this command. With a negative approach, one merely shuts the door on the dog while he or she rushes through it. They learn quickly to hang back on the word ‘Wait.” The positive way is by using treats and praise. Stand near the shut door with your dog. Tell him or her to “Wait.” Open the door slowly. Hold back on the dog’s collar and leash. The minute the dog relaxes say, “Good Puppy” and pop a treat in the mouth. Say “okay” and immediately go out the door for a walk or what ever. This will also reinforce the command. Eventually you can increase the amount of time the dog must “Wait” before receiving the praise or the treat. Dog management problems can be solved positively without using force, pain or fear. Be a little creative, talk to experts who use positive techniques and read a little. Think about it this way. When you had your first few jobs who was the person you enjoyed working for; the manager who was a big, blustery, bossy jerk who made you fearful and unhappy or the manager who treated you with respect, showed you what did wrong and provided solutions to help you avoid them in the future? You could quit working for the bad manager any time you wanted and go work somewhere else. Your dog does not have any such luxury.